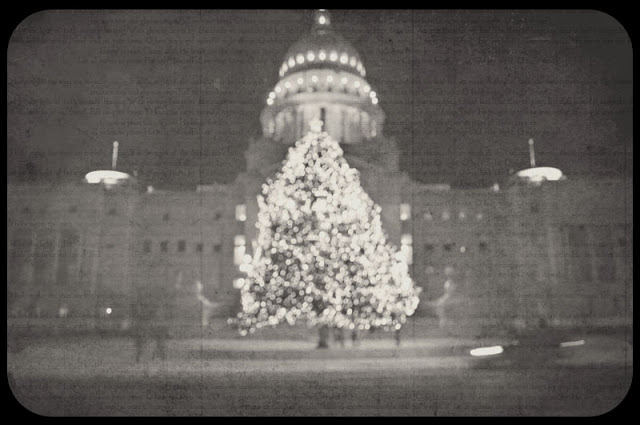 My husband the girls and I went Christmas light paroozing last weekend and visited the state capital. And by visited I mean my husband dropped me off at a red light with my camera, I ran over and took photos while he drove around and around the building waiting for me. Im sure the girls loved every second of it, right? So the photos were pretty eh. My goal was bokeh, my result was blurish bokeh. So be that as it may, I converted it to black and white and just went with it.